From Thanksgiving on the beach, to a fall themed cruise this year, what could possibly be next? Maybe I just should plan a ski trip styled entirely in swimwear. Each of our trips lately have been so much fun, but challenging to style, with a reverse wardrobe for each. We spent this Thanksgiving with my sister and family, in Saint Petersburg, Florida. It was a fall holiday unlike any I’ve experienced. I’m used to cold weather, cozy sweaters, and boots for Thanksgiving. As we stepped off the airplane, I felt an instant heatwave, yet there were Christmas trees, wreaths and holiday decor around the airport. It felt like Christmas in July. The stores carried outerwear, scarves and gloves, and I was toasty in just a denim jacket. 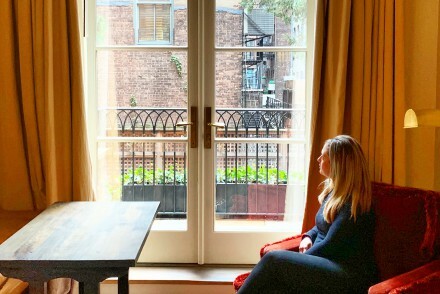 This year, I packed transitional clothing with long sleeve silk rompers, sleeveless fall dresses, and discovered some brand new, gorgeous resortwear pieces from Lilly Pulitzer. To style pieces in Florida, basically anything goes. You can still get away with florals and brighter colors due to the warmer temps, however a fall color palette and light layers work as well. 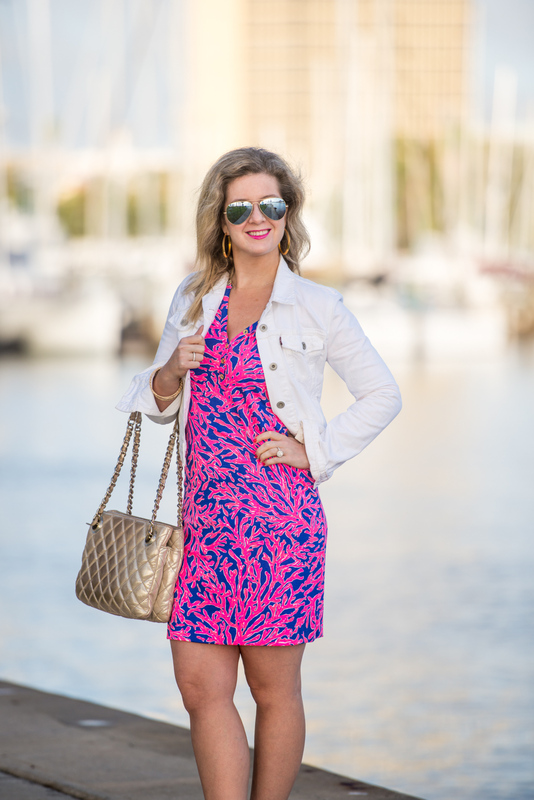 Lilly Pulitzer is a perfect destination for any warm weather getaway. 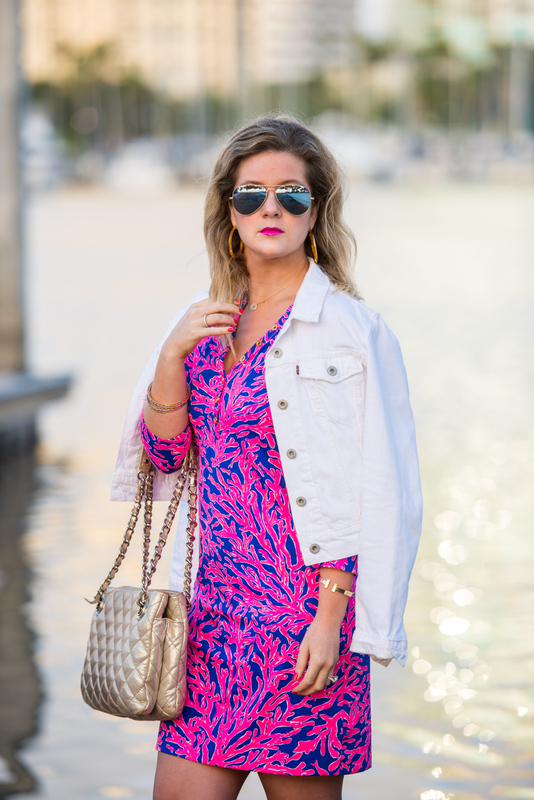 They carry resortwear everyday of the year, and honestly, the collection is so fabulous I may as well move to a warmer climate just so I can sport Lilly pieces year round. I’d have no complaints. Walking into the boutique on Madison Avenue feels like a perfectly printed, tropical dream. My eyes darted around the store unsure of what to try first. 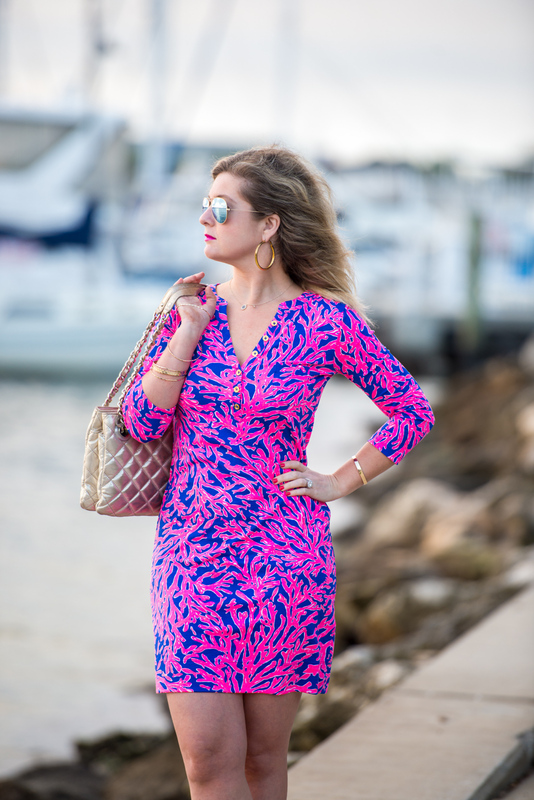 I tried several printed beauties and fell in love with the Alessia T-Shirt Dress in Tropical Pink. It was a perfect option to stroll around St. Pete. I added a white denim jacket (similar here), and accessorized with neutral, wedge Char Mar Sandals, a quilted beige Kate Spade bag (similar here), gold hoop earrings (similar here), and gold bangles (here and here). If you are planning an upcoming resort vaca for the holidays, I hope you check out the Lilly collection. I wore the dress for an afternoon out an about with the family. It felt amazing to be in colorful dresses again. I can’t live my life without them. We stopped for coffee in the morning. Starbucks is our family tradition, red cups and all. In fact, I wait all year long for those little red cups. No joke. If you know me well, you know I’m never without the Starbucks cup. We spent the rest of the afternoon wandering around St. Pete, exploring the farmer’s market and a lovely little clothing market. My dress was perfect for the stroll, and so comfy. We spent the evening on St. Pete beach, closing out the day with a champagne sunset with my family. It was perfection. In those simple moments, I reflect on how lucky I am to have them in my life. Our beachy Thanksgiving was truly one to remember.